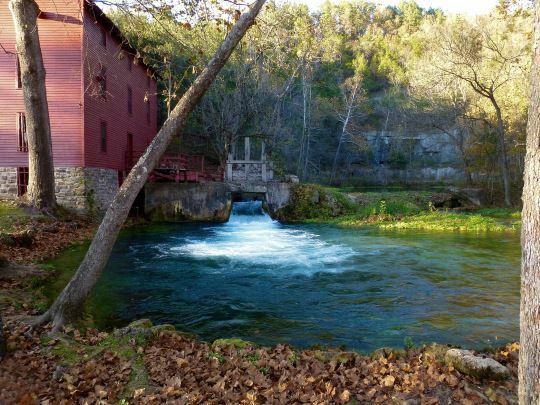 With its beautiful turquoise water, Alley Spring has a 100 year old grist mill which you can tour. The mill is open daily from 9:00 a.m. to 4:00 p.m. from Memorial Day through Labor Day. 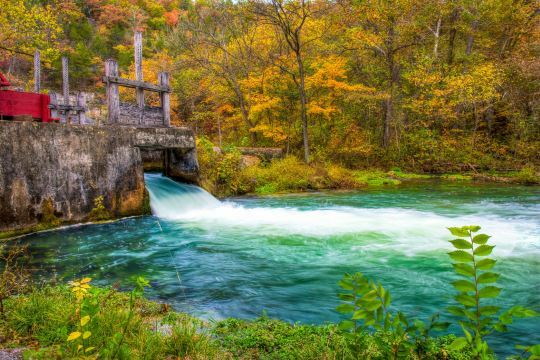 Stop in for an up close look at one of the Ozarks’ most famous landmarks. There is no charge, but donations help offset operating costs. Located six miles west of Eminence, Missouri, on State Highway 106. Books and postcards may be purchased at the mill. The mill machinery is no longer operational, although restoration efforts are underway. Alley was home, farm, and school for people who lived here a century ago. Dances, baseball games, and roller-skating were all part of Alley’s busier days. The first mill was built in 1868. A post office was established, named after a prominent local farming family, Alley. From that day to this, the area has been known as Alley Spring, Alley Mill, or just plain Alley. The present building was constructed during 1893-1894 by George Washington McCaskill as a merchant mill. With a turbine rather than a water wheel, and with rollers rather than stone grist stones, it was considered to be very “high tech” for its day. It served the needs of the local community by processing the farmers’ grain. Originally unpainted, it was first painted white with green trim, then later the famous red color associated with Alley Mill today.